A 10-foot-long great white shark spotted off the coast of Atlantic City this past weekend may eventually give birth to a litter of pups, according to a marine life experts. The female shark pinged about 50 miles off the shoreline this weekend, researchers at OCEARCH said in a tweet on Monday. OCEARCH is a non-profit organization dedicated to the study, safety and tracking of sharks. More than 300 sharks have been tagged with GPS devices since the group launched its first expedition off Mexico's Guadalupe Island in 2007. The organization's work became famous around the Jersey Shore when scientists began tracking Mary Lee, a great white who measured 16 feet long and weighed nearly 3,500 pounds. Her following grew every summer as OCEARCH tracked her movements and fans gave her an identity on social media. Mary Lee disappeared last winter at the age of 20, likely never to be seen again if the battery in her transmitter died, as researchers suspect. 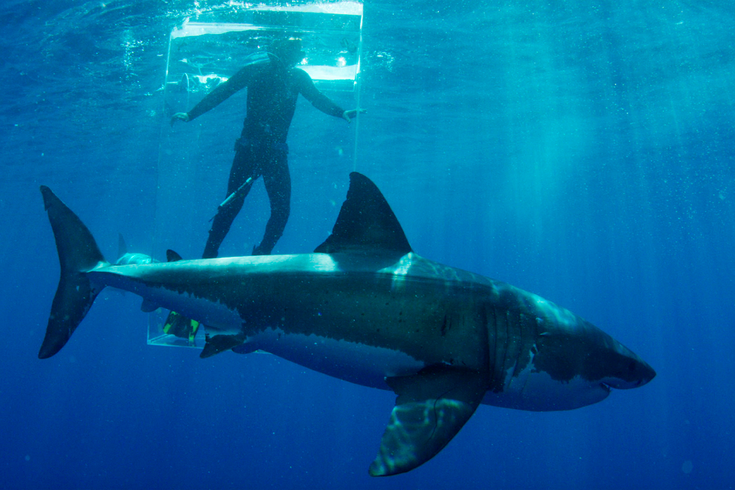 Great whites can live into their 70s. At least two other great whites, 12-and-a-half-foot long Hilton and a pup named Finn, have since entered OCEARCH's radar off the New Jersey coast. The latest great white, identified as Jane, already got a social media account of her own. She seems to like the New Jersey coast and is considering it as a home for her future litter. If Jane is anything like Mary Lee, it's likely she'll be pinging 50 miles off Atlantic City at around the same time each year, repeating her itinerary annually as she gets older.